9/27 Movie Ticket Raffle Winner! This week's winning raffle ticket: 301551! If you're the lucky winner, please swing by the store with your ticket to pick up your two free Regal Cinema movie tickets! TONIGHT: Happy 45th Anniversary to It's A Small World! We are just hours away from the opening of the Small World tribute exhibit! Tonight's reception features works by 45 artists celebrating 45 years of Disney's It's A Small World. Join us for Joey Chou's signing of his new book, live painting demos, fantastic raffle prizes, delicious refreshments, LOTS of new print releases and even SINGING artwork! Jackie Huang's Small World Pop-up - Theme Song Included! Jackie Huang has always been an avid fan of both Disney and Mary Blair, so creating this fun pop-up for our It's A Small World exhibit was right up her alley. For Jackie, creating a pop-up piece challenges her artistry in an entirely different way than when doing an illustration. "You have to find a balance between the engineering and the art - one always leads the other." For this particular piece, the artist put her engineering to the test. Not only does this pop-up highlight the "Small World" attraction's original architecture and dolls, it even plays the theme song! Click HERE to see Jackie Huang's pop-up in action! These special edition pop-ups are limited to 10, each of which are signed, numbered and hand-cut and assembed by the artist. Stop by tomorrow night to sing the theme song with us and snag your very own Small World pop-up while you can! Small World Print Release from Seb Mesnard! After three years of working as a graphic designer in advertising, French illustrator Seb Mesnard chose to pursue his ultimate dream of illustrating children's literature as well as working for animation studios such as Xilam, Gaumont Alphanim and Mondo TV - and we sure are glad he did! The artist's work has been featured in numerous Nucleus exhibitions, including Terrible Yellow Eyes, Enchanté, Zombies In Love and most recently, our Harry Potter Tribute Exhibition. Seb even joined our team as a guest curator for the Edward Scissorhands 20th Anniversary Tribute. For our upcoming exhibit, It's A Small World, Seb has created "l'accordéoniste", an adorable tribute to Mary Blair and the attraction's original dolls. Mesnard also wanted to pay respects to his hometown of Paris, France: "...but through the clichés and retro visions that other countries have of us." Seb Mesnard was one of the first to hop onto the "It's A Small World" ride at Disneyland Paris when it opened in 1992! Lucky Seb! Michelle Romo: Making Our Small World a Cuter Place! With an undying love for all things cuddly and cute, artist Michelle Romo has spent the last six years developing her web-based company, Crowded Teeth. The online shop features affordable art prints, bags and accessories all based on Michelle's adorable illustrations. The self-taught illustrator turned designer credits Mary Blair's work on "It's A Small World" as a huge influence on her overall design aesthetic. Romo, who still treasures a copy of the original "Small World" book, was thrilled to be a part of our upcoming exhibit and book launch with Joey Chou. "I LOVE 'It's A Small World'. LOVE. Joey's book is beautiful and fits the 'Small World' universe perfectly!" True to form, Michelle has given us the "warm fuzzies" with this undeniably sweet piece titled "Hugs From Around the World". "I loved working on this piece! I feel like it's just an extension of my own artwork! the world that the "Small World" song is trying to send. Who doesn't love a hug?" Michelle took her first "It's A Small World" ride at Disneyland California when she was just four years old. It has remained her favorite ride ever since. "Everything is so pretty and sweet and designs are just beautiful. My favorite part might be the outside of the building! Just walking up to it when you are a little kid, and still today - you can just sense the magical cuteness inside." When the "It's A Small World" attraction opened at Disneyland California in 1966, Walt Disney invited children from all over the globe to attend the grand opening celebration. They brought with them water from the oceans, lakes and rivers of their homeland and poured it into the ride's flume, which now holds half a million gallons of water. Michelle Romo will be one of the artists in attendance on opening night. Stop on by this Saturday to give us a hug and check out Michelle's "Hugs From Around the World"! Chris Turnham's Small World Print! Los Angeles based illustrator Chris Turnham never ceases to transport our imaginations to a magical destination far, far away. Turnham has most recently lent his whimsical illustrations to that of Scholastic, Monocle and LAIKA Entertainment films such as "Coraline" and the upcoming "ParaNorman". When invited by his good friend, Joey Chou, to be a part of the "It's A Small World" exhibit, Chris immediately said yes. "Not only is Joey's new "Small World" book beautiful, but like all animation artists, I have a huge love and respect for Mary Blair and the work she created for Disney all those years ago. She's been an inspiration of mine all throughout my artistic development and I never get tired of looking at her work." With that, Chris got to work on this gorgeous tribute to some of our world's most recognizable landmarks. "Landmarks Around the World" was inspired by a series of abstract concept art pieces that Mary Blair created for the original "Small World" attraction by layering and overlapping bits of tissue paper. Chris has achieved a similar effect by using screenprinting as his medium. The artist recalls waiting in line to take his first "Small World" cruise at Disneyland California as one of his earliest childhood memories. "I like to think that seeing those graphic shapes on the outside facade of the ride helped plant the seed that led me to become the illustrator I am today." We are thrilled to have released a very limited edition print of "Landmarks Around the World". Signed and numbered by Chris Turnham, this exclusive hand screened print is limited to only 23. Zombie in Love fan art! Here are just some scans of your artwork from Saturday's drawing demo and signing with Scott C! All of them are up on our Flickr page here, so take a look and enjoy. Scott C will be back before you know it on October 8th for his Amazing Everything signing! Many have drawn similarities between the work of Lorelay Bové and "It's A Small World" creative mastermind, Mary Blair. However, Bové tells us that it wasn't until relocating to the United States from Spain and studying character animation at Cal Arts that she learned of Blair's legendary work with Disney. Ironically, Lorelay Bové has begun to make quite a name for herself in the world of Disney, working as a Visual Development artist at Disney Animation Studios. It really is a small world, after all! The artist, who got her start in the industry with an internship at Pixar, has helped to bring such films to life as Tangled, The Princess and the Frog and Winnie the Pooh. For the "It's A Small World" exhibit, Lorelay has created this lively, cheerful gouache painting, fittingly titled "Olé!". "I really enjoyed working on the "Small World" piece because it's such a fun and charming subject that one can really have fun with." When creating this piece for Joey Chou's "It's A Small World", Bové was inspired by both her native country of Spain and the attraction's original designs by Mary Blair. Lorelay Bové took her first "Small World" ride at Disneyland Paris, the closest Disney Park to Spain, with her family. "I was blown away by the theater-like staging and the layering, the design, the colors. It felt so right and well-balanced. I loved it!" The "It's A Small World" ride at Disneyland Paris features a finale where the song is sung in French, German and English. You can also hear the song sung in Arabic in a room dedicated entirely to the Middle East. That's quite a diverse choir! Be sure to come back and visit our blog for more artist submissions and fun facts. And be sure to join us on opening night to check out Lorelay Bové's "Olé!" up close and personal! Artist/Illustrator and Los Angeles local, Joey Chou, has collaborated on several projects with the likes of Cartoon Network, Disney, and Laika House, for starters, and is currently a designer for Nickelodeon Animation. In addition to his love for animation, the artist holds a soft spot for illustrating children's books, including his self-published "Crazy By the Letters: Mental Problems From A-Z". The book takes the reader through a morbidly humorous alphabet of mental illnesses, each of which are accompanied by one of Joey's light-hearted illustrations. Most recently, Chou has lent his intricate, captivating designs to Disney Publishing's latest release: "It's A Small World". The artist gives a charming and modern spin to the classic while staying true to the vision of the original book. Chou describes his experience working on "Small World" as "A dream project and personal triumph. It has been a great pleasure working on the book and I hope that everyone enjoys it." Chou has always drawn influence from the work of artists of the 1950's and 1960's, especially that of Mary Blair, who was primarily responsible for the Disney Park attraction's whimsical style and design. This year marks the 45th anniversary of the happiest cruise to ever set sail 'round the world and on September 17th, Joey Chou will join forces with Nucleus to present IT'S A SMALL WORLD, a delightful exhibition that features an impressive roster of 45 artists who pay a well deserved homage to this iconic attraction. The Disneyland version of the "It's A Small World" ride features over 400 dolls that represent 7 regions of the globe: North America, Africa, Asia, the Arctic, the Southern Seas and Europe. All of the dolls were crafted with identical faces by "Small World" designer, Mary Blair, to stress the attraction's concept of peace and equality among different cultures. The single most widely translated and globally performed song of all time, "It's A Small World (after all)" made its debut on May 28, 1966 as Disney Parks celebrated the attraction's grand opening. This anthem for global unity (and song you can't ever forget) was created by two of Disney's most acclaimed songwriters, Richard M. Sherman and Robert B. Sherman. The Sherman Brothers were approached by Walt Disney himself to create one song (originally, the ride was accompanied by several national anthems being sung simultaneously) that would not only convey the message of world peace to its listeners, but would also be easily translated to the many languages and cultures around the globe. The song remains the only creation by Disney that has not been copyrighted, at the urging of UNICEF, who wanted the song to forever be "a gift to the children of the world." The soundtrack to this beloved boat ride was not recorded by one group of performers in a single studio. In fact, it was deliberately recorded in several studios spanning the globe to even further emphasize the theme of unity. The original recording includes the voices of choirs, performers and children from London, Rome, Tokyo, California and Mexico - all masterfully compiled into one unforgettable ditty! You can set sail on the magical "Small World" cruise at Disney Parks in Tokyo, Hong Kong, Paris, California and Florida but we hope that while on your journey around the globe, you make a stop to join us on September 17th as we celebrate the 45th anniversary of this all-time classic and the enchanting illustrations of Joey Chou. Joey's first "Small World" ride was in 1988 at Disneyland Tokyo. When was yours? 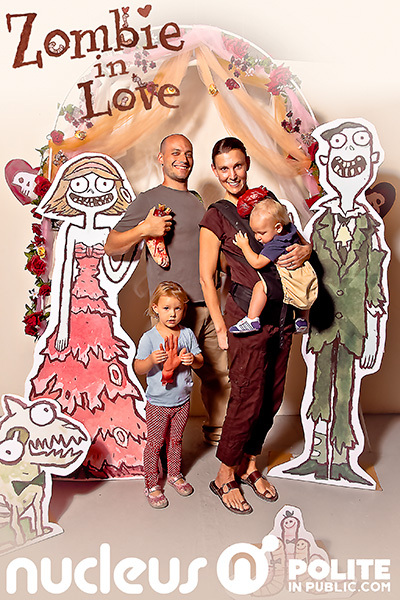 A huge thanks to everyone who made it out this past Saturday for Scott C.'s Zombie in Love book release & art exhibit. Special thanks to Joe from Polite in Public for the photo zone! 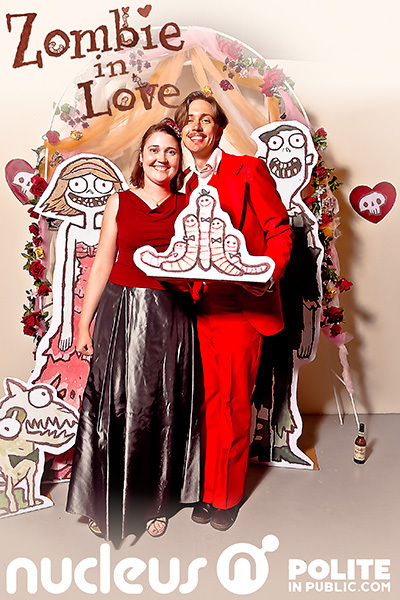 We all had a blast; the proof is in the pictures! All of Scott's pieces from the show, the limited edition Zombies in Love print, and even our Nucleus exclusive stickers are now available online, so be sure to take a look, especially if you're not in the LA area from now until the 26th. Stay tuned for the Amazing Everything signing with Scott C. on Saturday, October 8th, which coincides with our dragon exhibit's opening reception. Risking spilling the beans on whether poor Mortimer eventually finds the ghoul of his afterlife, we've been DYING to announce that we are releasing this limited edition giclée at tonight's zombie prom reception. The edition of 50 is signed & numbered by Scott C.
Who could this this lovely lady be that Mortimer is sharing his brain cake with? They look to be having a splendid picnic! We are also excited to share that the book has been selected by the Society of Illustrators NY as one of the best children's books of the year. Go Scott!! This is the image that will be exhibited in the juried competition. You can nab your very own here. 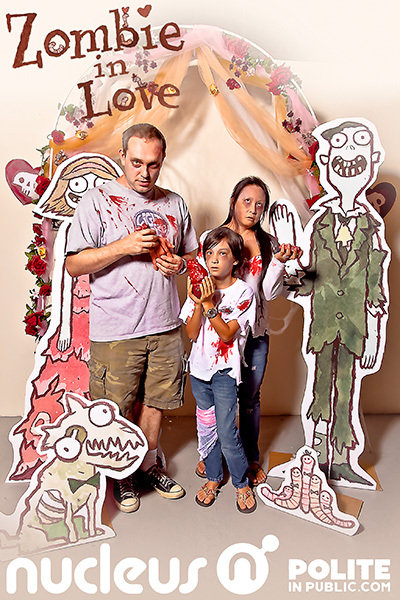 Zombie in Love Photo Booth Op! One more reason to stay in (or migrate to) the LA area this Labor Day Weekend! 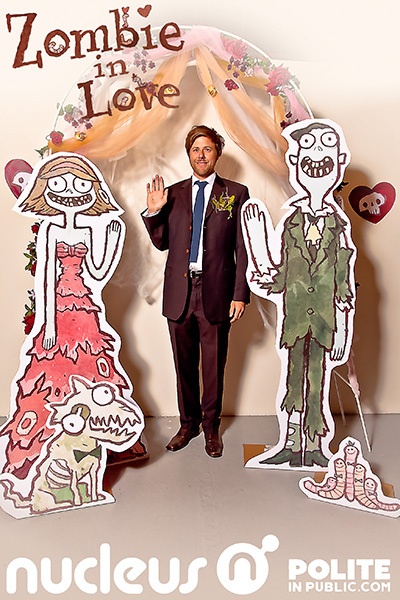 At this Saturday's Zombie in Love reception, in addition to hourly raffle prizes, door giveaways (for the first 25), book reading & drawing demo at 6 pm, we'll also have a FREE photo booth op with Mortimer and friends—sneak peek below. Come in your best-dressed ready to strike a pose!